On Thursday, January 10, 2019, Lillian Esther Edwardson (née Roberts) went home to be with the Lord at the age of 85. She lived a wonderful life and like a stone thrown into a lake, the ripples of how many people she touched are a testament to a life well lived. Lillian was born on July 8, 1933 in Brooklyn, New York, the oldest of three siblings. After graduating from Bay Ridge High School in 1951, Lillian trained as a nurse and worked to nurture and care for many patients over her career. She worked the night shift on the eve of Y2K, December 31, 1999, and then retired from nursing shortly thereafter in 2000. Lillian met her future husband, Harry, in Brooklyn in 1954. They were married in 1956 and raised four sons, first in New York and then settling in Ardsley, PA. They were married for 61 years before Harry passed away in 2017. She learned to play the violin in the second grade and continued to play over the years, up until the week she died, last playing at the Hillcrest Center in Wyncote to a crowd of happy listeners. Many will remember Lillian as someone who made it a point to keep in touch, either through a card, a letter, a package or a phone call. She rarely forgot a birthday or anniversary and her thoughtfulness touched many lives. 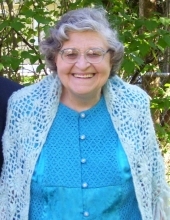 Lillian is survived by her brothers, George Roberts (Evelyn), Jim Roberts (Leonor); four sons, John Edwardson, Sr. (Jennifer), James Edwardson, Peter Edwardson, and Andrew Edwardson (Nicole); 10 grandchildren, Rebekah McLendon (Denard), John Edwardson, Jr., Jessalyn Mifflin (Geoffrey), Kerry Edwardson, Thomas Edwardson, Erik Edwardson (Victoria), Kyle Edwardson, Brett Edwardson, Shelby Edwardson and Sydney Edwardson; Three great grandchildren, Eden McLendon, Dinara McLendon, and Wesley Edwardson, and many cousins, nieces, nephews and friends. "Email Address" would like to share the life celebration of Lillian E. Edwardson. Click on the "link" to go to share a favorite memory or leave a condolence message for the family.